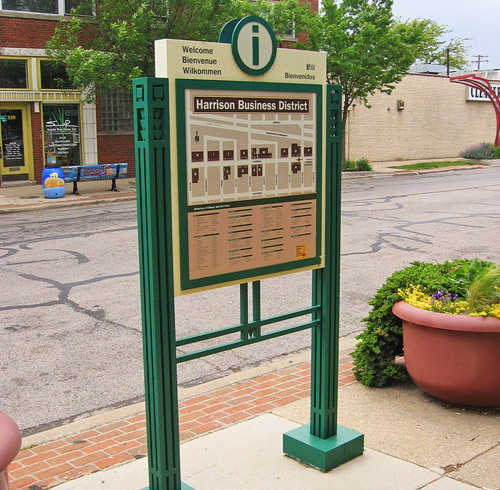 The purpose of streetscape signage, including gateway markers and directional (wayfinding) signage, is to provide an overall image of a neighborhood or district, mark edges or entry points, and give information about directions, destinations, or the neighborhood in general. Signage plans should be developed on a neighborhood basis, specific to the needs of that district. They are most appropriate to downtown, commercial, or tourist-oriented locations, or around large institutions. Less traveled areas may still include some basic informational signs or neighborhood markers. 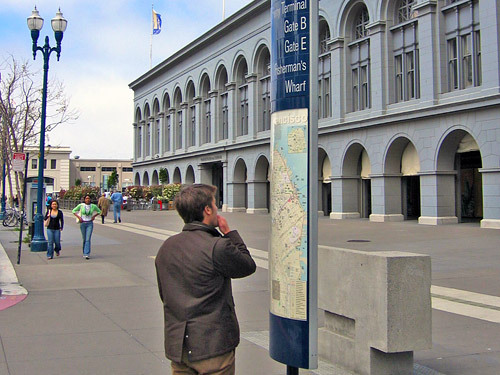 The San Francisco Municipal Transportation Agency (SFMTA) is responsible for installing and maintaining street and transit signs in San Francisco. To make a request or report a maintenance issue with a standard city sign, call or go to 311. Special streetscape signage typically requires a Minor Sidewalk Encroachment Permit or Major Encroachment Permit from DPW, depending on the scale of the project. Gateways are markers or monuments located at the entrance to a district or neighborhood to announce the entry to a particular area, or a transition from one area to the next. 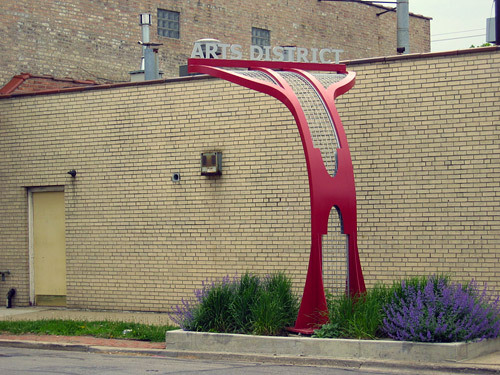 Gateways may be a literal gateway, markers on either side of a street, a singular large sculptural or iconic element, or even a unique landscape feature or plaza. They are generally more artistic or sculptural, and less literal or functional than other types of signage. Neighborhood orientation signs provide a central element to provide district or neighborhood information, including the area’s name, neighborhood map, list of destinations (such as primary cultural institutions, historical buildings, and sites of significance), with a distinctive, coordinated design. On most streets, the typical street sign is all that is needed to orient pedestrians to major destinations. However, on streets and public spaces with heavy pedestrian volumes, additional directional signage is often helpful. This is especially true on streets that handle greater numbers of visitors (such as downtown, ceremonial, or commercial streets), on major transit routes, or in tourist-oriented areas. Directional signs are typically much simpler than a neighborhood orientation sign, featuring only place names and wayfinding information. They should have a distinct and coordinated design in keeping with the character of the surrounding neighborhood or district. Well-designed directional signs can help create a distinct identity to a neighborhood. Include destination icons, place names, and directional markers (e.g. arrows) for local destinations on blades or integral to the body of the sign. A map clearly showing current location and the best routes to nearby destinations should also be considered. Use external illumination the focuses light on the signs themselves, not on pedestrians. Internally illuminated signs should be avoided as they are typically designed to attract drivers and are too intense for pedestrians. Directional signs should use reflective coating to minimize glare. Interpretive signs give historical, cultural, natural or architectural information about their particular locale. 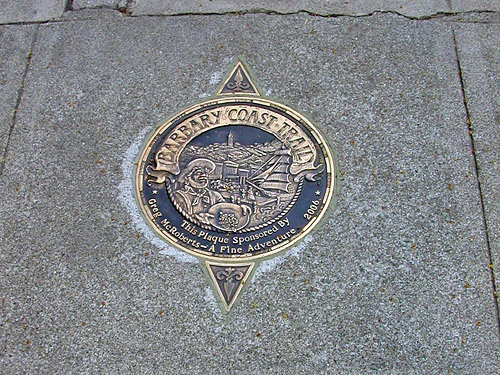 They may be part of a historic trail, identify a particular site where an important event occurred, or describe other aspects of a neighborhood’s past or present. Community organizations sponsoring signage projects are typically responsible for maintaining the signage and will typically need to sign a memorandum of understanding with DPW covering ongoing maintenance and liability of the project as a condition of acquiring a permit. The SFMTA is responsible for installing and maintaining standard street and transit signs in San Francisco.